You probably can’t blame a guy for getting violently robbed at his home, but in the case of Alex Merkel’s “ram raid terror”, reported last week on the front page of the Evening Standard, the details may reveal something about the victim. Merkel is twenty two. He has started twenty eight league games in his career, seven of which have come since joining us – moderate, unglamourous, distinctly second tier Watford – in January. Merkel also lives in Hampstead and drives a Maserati. Much like getting burgled is rarely someone’s fault, it’s also no detraction of Merkel’s character if some other guy wants to pay him too much money – but it does suggest that the mirage of success has come too soon for the German. Then there’s this photo that he posted a few days ago on Twitter to assure us all that he was alright (NSFW). I’m not saying that Alex is a wrong ‘un, necessarily, but there definitely seems to be a significant disparity between how good he thinks he is, and how good he actually is. To be fair, he was put in a bad position from the outset. Unlike some of this season’s other disappointments, who we gradually came to wonder about as results got worse and worse, he arrived in January with the club in the doldrums and looking for a galvanising hero. His debut against Reading was neat but entirely underwhelming on the ball and sloppy off it. While he was able to pass the ball ten yards perfectly well, there was no underlying premise. Almen Abdi, whose replacement we were frantically searching for in January, can make two yard passes exciting, because you know that he’s constantly evaluating the space ahead of him, constantly changing angles to open up an avenue of penetrating attack. Merkel was just putting his foot on the ball and knocking it back to Joel Ekstrand. It was fine, but by no means the breath-taking incision that we hoped for from a player who had lined up alongside Zlatan Ibrahimovic, Clarence Seedorf and Oguchi Onyewu while he was still a teenager (look how out of place his name looks in this side). Then he got sent off. And no sooner than he deserved to be. A 42nd minute booking preceded a host of late and silly challenges that left the midfielder skating on thin ice. Late in stoppage time he crashed though it as he lunged at a loose ball but only made contact with Nick Blackman’s ankles. That was pretty much it for Merkel. Though history will state that he played in a further ten games for the club, not one of his appearances made anything resembling an impact. His name on the bench became more of an ‘Oh yeah. Him.’ than anything else. His almost-certain departure this summer will elicit in most an insouciant shrug, and you would imagine the midfielder’s response would be much the same. When he signed in January, Merkel wouldn’t have expected to play such a peripheral role, but he might want to get used to it until he knocks the professional photo shoots on the head and realises that he’s not a hot young thing any more and has no footballing home. Where would we have been if it wasn’t for the February injection of the Australian skipper’s leadership qualities? And did you see how he conducted the side to hold on valiantly against a dispirited and rubbish-to-begin-with Barnsley side in his six minutes in a Watford shirt? Impeccable stuff. There was no harm in signing Neill. We were getting a bit light at the back and the addition of an old head, no matter his lack of impact on the pitch, may have contributed to our improvement over the past few months. Plus, assuming his contract was largely performance-based, we’ll have only shelled out enough money to fund a couple of packets of Tim Tams and a day pass to the Sydney ferry. His 250 minutes of competitive football this year, the bulk of which has come since he joined Doncaster at the end of March, failed to get him the space on the Australian plane to Brazil that he so badly coveted, but oh well – no harm no foul. If there’s one thing that Park Chu Young taught us in his time at Watford – which there probably isn’t – it’s that the Korean phenomenon of cult worship really is something else. He might not be reaching K-Pop levels, but the domestic pride and interest in a player who hasn’t really been a footballer for the last four years is really quite astounding, especially since his returns before then were hardly the sign of a superstar striker (his Korean fame came after four years at FC Seoul that yielded just twenty three goals). For a good month after he jumped the fence on loan from Arsenal, the press area in the Upper Rous held several representatives from the Korean media, eager to report on their fave’s latest exploits. The fact that he didn’t have any didn’t dampen their resolve and they kept coming, finally realising that their scoop may not manifest itself around the same time that an injury saw him return to his homeland for intense medical treatment before the World Cup. Park’s inclusion in Korea’s squad for Brazil was heralded back home – for a player who has scored more than ten goals in two seasons over the course of his career. Of course, goals don’t mean everything, and strikers can bring other things to a team – just look at little Fernando Forestieri. But I wouldn’t know about Park’s contributions, because I don’t think I ever saw him play. But an hour of football was all it took this season to convince national team coach and proper Korean legend Hong Myung-Bo that the striker still had it – just don’t tell Lucas Neill. For some reason, I found it very hard to say anything about Mathias Ranegie. A useful, if not astonishing striker, he will be a nice option to have next season – if he’s still here. To call the Swede a Troy-Deeney lite would be unfair, but not completely wrong. He’s a bit stronger than Troy and can dominate physical defenders, but doesn’t have the ball skills or the energetic attitude. Instead, he contributes in his own sullen way, with spasmodic interventions or bursts of liveliness. Which isn’t to say he’s been in any way bad or that his attitude is a problem – he’s just hard to get enthusiastic about. When he arrived I expected little-to-nothing, a made-for-Sweden striker who had been signed in a fit of exuberance by a now-regretful Udinese. But he was much better than what we had – his two goals against Blackpool were very well taken, and he put himself about admirably while trying get his hattrick. Indeed, four goals in eight starts is a good return, and he formed a fine but not always fruitful partnership with Deeney. Next year, as Deeney’s replacement rather than his right-hand man, Ranegie might have more of a foil for his physical talents – which would be nice. So, yeah. He’s fine. We’ll see. He’s pretty good. He’s not a wing-back. It’s not clear whether Riera’s March move to Hertfordshire was considered as a layover before engraining himself in the Northern Italy flock this summer, or was more a try-before-you-buy deal to see how the older fancy dan would fit in with our altogether younger troupe of fancy dans. If it’s the latter, I’m not sure how it went. Riera is a nice player, who is capable of some fantastic stuff. His opening goal against Ipswich didn’t require him to unload from his box of tricks but showed that he can be direct and unpredictable, hooking a perfectly-struck strike with his wrong foot through a not-too-inviting gap; and on occasion his link-up play down the wing has been a joy as he contorts his phlegmatic, Scandi-noir detective frame to produce a flick or pass that deceives everyone around him. But he doesn’t contribute that much, especially in comparison to Daniel Pudil, who always wants to be involved at both ends of the pitch and will happily tramp up and down the left flank for ninety minutes. And as a wing-back, that is pretty important. 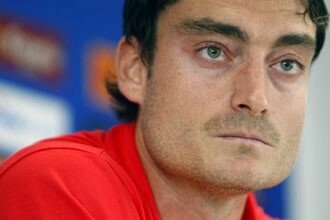 Riera might not have any particular aversion to defending, but he doesn’t have that much aptitude for it either. Five yellow cards in six starts (two of which led to his stubborn refusal to leave the pitch and cost him a shoulder-shrugging £2,000 fine) were mainly the result of a wafted foot in the direction of a winger sauntering past him. In too many matches, Riera was completely nullified for the final third of the game as he trod on eggshells, a mistimed challenge away from a red. So while it would be nice to have someone of Riera’s calibre around, it would have to follow a change of system to keep him away from concentrated defensive duties and to accommodate Pudil, because given a choice between the two, the Czech would win every time. *With apologies to Swedish speakers. Well, it took more than sixteen goes (I’ve omitted the three loanees who left before the end of the season), but with the last signing of the season, both alphabetically and chronologically, we finally landed on an incontrovertible gem. The Hungarian midfielder is a name that was linked to us virtually every transfer window before his loan signing from Genoa finally came to pass in January and he was worth the wait. He’s not flashy or particularly ground-breaking in what he does but it’s the fact that he does it so consistently that makes him special. While the talk all summer and, unfortunately, throughout the season, was about replacing the tenacity of Jonathan Hogg and the leadership of John Eustace, the thing that we really struggled to replace was Almen Abdi’s on-pitch orchestration. Toszer, who likes to sit so deep that during Hungary’s recent friendly against Denmark he was practically a centre back, fills the space that Hogg used to, though to a particularly different end, and if signed permanently would presumably replace Manuel Almunia as club captain, but also allowed us to recapture the feeling of midfield calm and methodicism that was completely missed during the Swiss’ time out with a foot injury. Together, they may be a bit too cool for some Championship fixtures – more like a cat pacing around a patio looking for the best place to sun itself than a guard dog diving at the feet of invading public servants – but both are just supremely watchable in their elegance and when matches do open up for them, as a few did towards the end of the season, they glide around the midfield like two champion waltzers, dipping into open space and moving play on quietly and efficiently until suddenly you’re the other end of the ballroom and Lewis McGugan is firing the ball over the bar. Add a wicked left foot and a love of playing diagonal balls over the back line half a yard too far in front of his BFF Pudil and you have a player who could open up a goal-scoring chance at any moment. The most underrated thing about him? The fact he’s always there. In two years of foreign imports and glamourous free transfers we have accepted that it takes time for a player to adapt to the English game and the fabled championship, and moreover that if a player hasn’t played for his massive club in over a year, then there’s bound to be a certain amount of time before they’re at peak fitness – even before you factor in the mysteriously common muscle imbalances. Toszer arrived at the back end of January having not played a sausage for Genoa since a 19th May trip to Bologna and with one experience of English football – a 5-0 drubbing at the hands of Chelsea in Genk’s 2011/12 Champions League campaign. Despite this he started twenty of the twenty one games following his arrival and finished each and every one of them. Though this doesn’t mean that we should now expect the same of every foreign signing to cross the threshold of Vicarage Road, it just goes to show that an instant impact can be had. Now just bloody sign him up. If you missed Parts One and Two of this fantastic oeuvre, you can find them here and here, respectively. Alternatively, you can go to bHappy and see how Matt Rowson saw the whole deal go down here.